What’s the difference between a friend and an acquaintance ... an acquaintance generally inhabits just one area of your life while a friend becomes involved in many layers of your life. But women definitely need both friends and acquaintances for the ideal balance. A couple of years ago, my sister joined a training group to boost her chances of completing a triathlon. She told me there were lots of women athletes and that most were just acquaintances. In all those long months of training, only a couple became her good women friends (and yes, they often bonded over cheeseburgers and fries after a grueling workout). Those women friends were the ones who felt her disappointment at having to sit out the first race with an injury. And they cheered her on when she made it through the second round of training and scored the medal. They were also generally the ones who ran, biked and swam at the same pace as she did. (Hey—it’s hard to complain about shin splits to someone sprinting past you!) But she will never complain about making those new friends, blisters and all. There’s an intimacy between women friends that usually doesn’t develop with acquaintances. An acquaintance might loan you a book you showed an interest in; a friend leaves a good book on your porch because she knows your taste in reading. 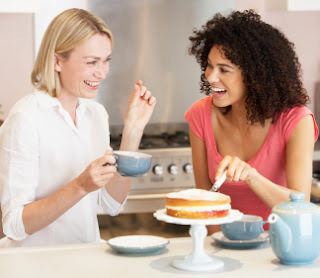 An acquaintance is the mom at school you chat with on the playground after drop-off; a friend is the mom who makes a point to catch up with you to share the talk she heard on the other side of the playground. You might invite an acquaintance to a dinner party; but it’s your friend you’ll ask to bring extra chairs. An acquaintance might be a friend at work whom you meet in the lunchroom every day, but whom you rarely see once you clock out. But in thinking about this topic, I’ve come to realize how much I value the acquaintances in my life. It can be rejuvenating to share lunch with a co-worker who just talks shop—and who doesn’t know about your brother’s money troubles or your cousin’s health woes. And most of the time, our women friends start out as our acquaintances until we discover how much we enjoy each other’s company, opinions, humor and the like. Eventually we are laughing together about what good taste we have in friends. Friends—especially women friends—quite literally help turn mountains into molehills. In a study of women standing at the base of a hill, those standing with a friend gauged the climb to be less steep than those who stood alone. I recently experienced the power of the previous study’s findings. About a month ago, I hosted a weekday brunch for moms of kids attending my daughter’s new middle school. Although the large group included several women I knew well, the majority of my guests were new acquaintances. My hope was to create a circle of women friends at middle school that was similar to the supportive group I’d had at elementary school. But I started feeling a bit overwhelmed as the kitchen filled up with more and more women who knew just one thing about the others—we all had 6th graders. The doorbell rang again just as I was juggling making introductions and pouring coffee (and wishing I’d planned for name tags). I caught my friend Sarah’s eye and without a word, Sarah turned to answer the door, greet the new guest and bring her into the fold. I relaxed and started to enjoy the gathering. Two of the ‘new acquaintances,’ who later reached out to get together again, are happily developing into friends, which was my desire. And this is another key way acquaintances turn into friends: we make time for a friendship. And until you can find or make the time to spend with your friends, it’s equally important to stay connected, even if only by electronic means. Researchers found that women are much more likely than men to stay in touch with their women friends via texting, emailing and phoning. These forms of communicating show our friends we care about them and are thinking about them even when we’re not together. So if you want to test the friendship waters with an acquaintance go ahead and take the plunge. The odds are good that if you have one shared interest or activity, you will find more. And remember that our friends are often the ones in our lives to introduce us to new passions...and new acquaintances who have the potential to become friends. I hope, like me, you too are seeing the win-win here, which is that we all need both friends and acquaintances for a balanced life.